How do we respond to travesties and realities that are taking place unless we are first aware that it is happening? Tragedy has again taken place on the shores of Libya. Ethiopian Christians have been beheaded and shot. 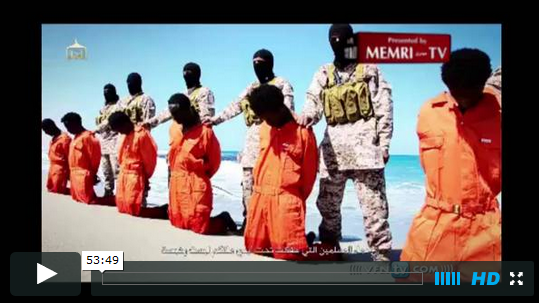 Extremely raw graphic images displays Radical Islamists marching Christians robed in orange garments along a shoreline. In the same video, another lineup of Christians are shown with Radical Islamists armed with rifles stand behind them. A man dressed in black, pistol in hand, states “our battle is a battle between faith and blasphemy…” He continues to quote the Koran as the video graphically shows Christians being beheaded and shot from behind in their heads. Some have stated that Islam is a peaceful religion. By witnessing these clear images, one can clearly see that this is the farthest reality from the truth. Islam is not a religion of peace. How did we arrive at this horrific reality? Muammar Gaddafi was the previous leader over Libya. In a CBS interview, Former Secretary of State Hillary Clinton said this, “we came, we saw, he died”, while the world witnessed the brutal killing of United States Ambassador to Libya Chris Stevens was brutally murdered and the U.S. Embassy was taken over. While these comments are being stated, President Obama has stated, “I consider it part of my responsibility as President of the United States to fight against negative stereotypes of Islam wherever they appear.”Many within the Body of Christ have received visions about horrific atrocities such as these, and worse, taking place within America, lest we repent. How are we to respond to a devastating travesty such as this? When we look at the words of Jesus in the Bible, we see a clear reality of the outcome for those who do respond and those who do not respond. In Matthew 25:31-46, Jesus tells a story about the sheep and goats. The goats are at his left hand and the sheep are at his right hand. In verse 42-43, Jesus says to the goats, “For I was hungry and you gave me nothing to eat, I was thirsty and you gave me nothing to drink, I was a stranger and you did not invite me in, I needed clothes and you did not clothe me, I was sick and in prison and you did not look after me.” How is Jesus going to respond to us if we do not respond to our brothers and sisters that were just beheaded for their faith in Jesus Christ? What is it going to take for America to wake up? What is it going to take for the Church to wake up? As the most wealthy and most powerful nation in the world, we can stand, we can respond. We must respond. Hear the full story of what is taking place, what to do during a time like this, how to respond, and so much more. Also shared in this segment: Radical Islam, Koran, Tripoli, Barbary Coast, martyrdom, persecution, beheadings, 14 Ethiopian Christians, Libya, Chris Stevens, Hillary Clinton, blasphemy, President Obama, Congressman, Senators, elected leaders, prayer, humility, Multiply Movement, Rick Joyner, coming storm, ISIS, and repentance. Greg and John shared in this segment.